I’ve written a few things over the years: short stories, poems (even won an award in high school [plus a $50 gift card to Circuit City if that tells you how long ago]), stage plays, screenplays, adaptive scripts, WAY TOO MANY tweets/posts and so on. However, when it came to attempting to write a book, I hesitated. Wormhole could open just as you’re about to send off your finished manuscript and swallow you whole (i.e. DON’T READ THE LATIN ALOUD). A little over four years ago, I began producing audiobooks. Very soon after my start, I met an indie author by the name of Erin Keyser. As you may already know, I’m the narrator for her Thunderbird Legacy series (Eyes of Lighting (ebook is currently free on Amazon) & Wings of Thunder are available in print, digital, and audiobook). The story follows Ivy Nimiki, an awkward teenager with a penchant for cynicism. Yeah, not sure why she cast me at all (yes, that WAS sarcasm). It wasn’t long before I considered Erin a friend. PSSST! She’s kind of awesome. Don’t tell her I said that. Anyway, the more I learned about her and her process, the more I got the itch to write. This, along with a push from loved ones, finally got me to stop talking and start typing. The manuscript would later become my science fiction novel One of Few. I’d finished another couple drafts up by the start of production on Wings of Thunder. I also went to continued education classes at Tarrant County College (where I graduated from) for creative writing to brush up on my skills. And HERE I AM… Ready-ish. Doing what few can. How fortunate I am. Locators are rare. Only eleven people can access chambers throughout the world. The fourth dimensional pockets themselves are a mystery. They can hold anything from both known and unknown worlds. With a locator’s ability comes power. A power that hasn’t escaped the notice of the Ceruleman race. They will stop at nothing to keep control of the chambers. Of the locators. Eleven isn’t a name you run across often. When you do, you tend not to forget. Unfortunately for the eleventh locator, that’s all she’s been doing. Forgetting. 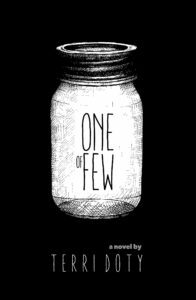 One of Few will be released on May 23rd for print and digital through Amazon with an audio version not too far behind. Over the next few weeks, I’ll be releasing more information. If you have any questions for me, feel free to shoot a message to [email protected] or leave a comment!